There are very few downsides to my work with Rose Water & Orange Blossoms. Except one thing: I share stuff, and then I’m held to it. Sweetless, Meatless March? It sounded good, and I was really ready to get off the sugar parade that had lingered since the holidays. Also the red meat: less is best and yet this is something I have not been good at abiding. So I went for it, and just to make it extra real, I let all of you know. What happened to keeping our sacrifices private, so that no one but God above is aware that a girl is pining desperately for French macarons, but she digs down deep and finds a way to resist? Not Maureenie; she has to put it all out there so that every time I’m in the presence of those in the know, which is very often, and the sweet things or the juicy meats tempt her, they stand there and watch and wait to see if she is going to have a #lentfail right before their eyes. I’ve done alright so far, in case you were wondering. In case you were hoping for a big ‘ole give-in that just might assuage any guilty feelings of your own for whatever eating habit you may be trying to change…. But when you work with food and have a personal obsession for pastry, then it seems that there’s no rest for the weary. Take those macarons. They’ve been everywhere I turn lately. 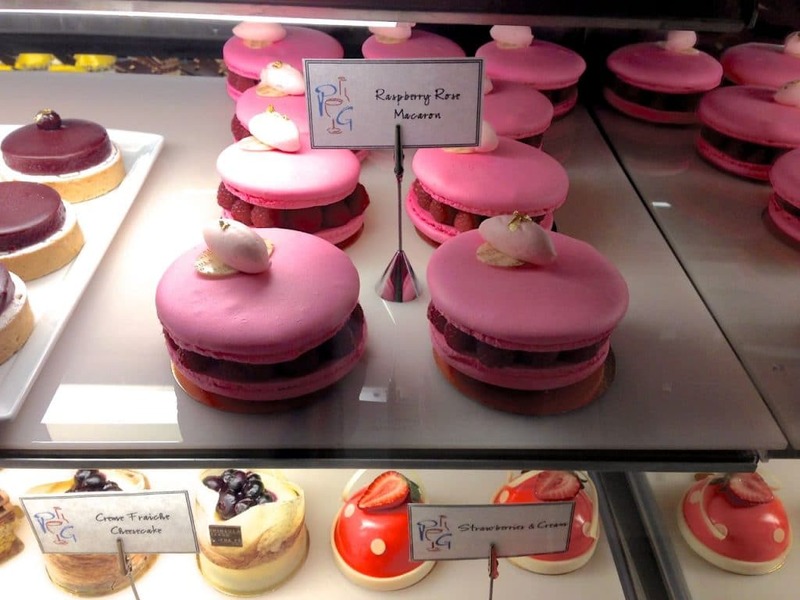 In Chicago, they peeked out from the pastry case at Pierrot Gourmet and ever so sweetly, every so gently tempted. But no. NO! 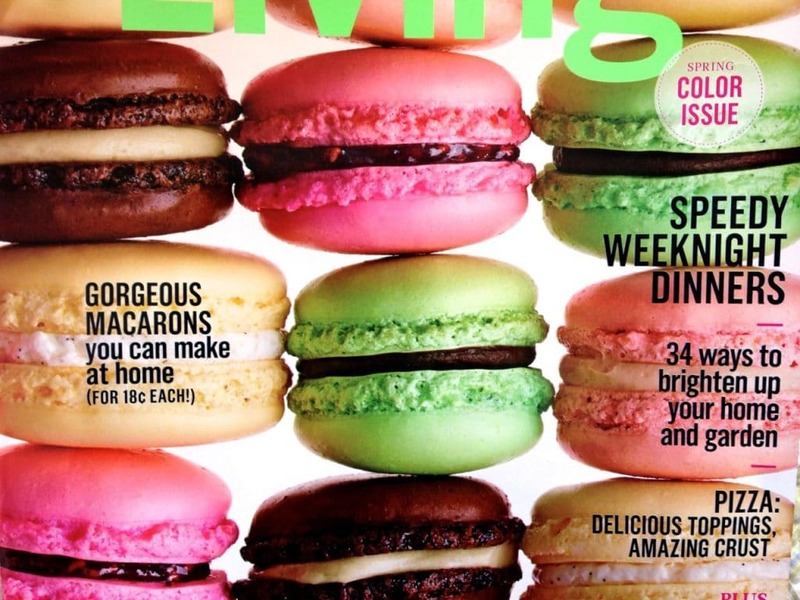 Then there is the crazy macaron-laden cover of Martha Stewart Living magazine. With step-by-step instructions, no less! We did make macarons in culinary school, so that experience along with this tutorial…I’m so money to lay down beautiful macarons with and for you. But no. NO. I shun macarons. 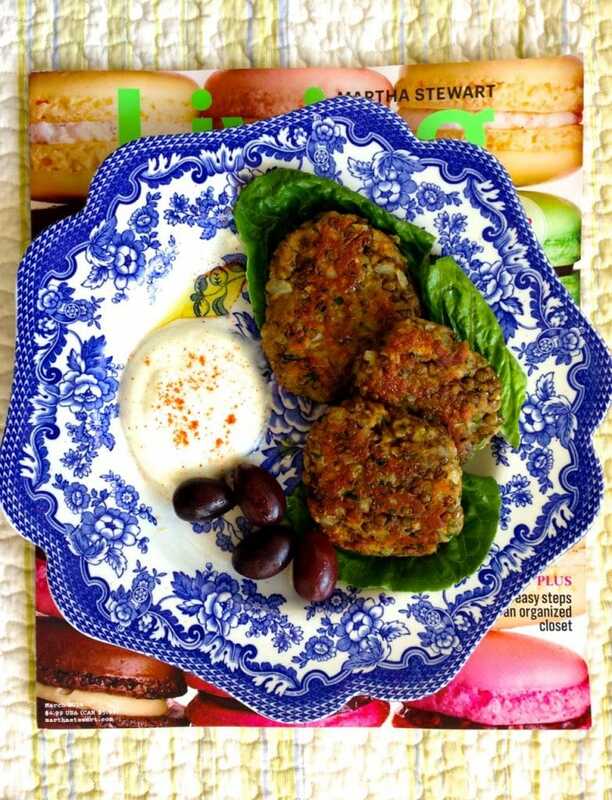 I open the magazine and see lentil patties, pan sautéed and served with a cool yogurt sauce. Hey, that looks good. That sounds good. And even though I promised you classic Lebanese lentil soup (rushta) in my meatless/sweetless line-up, I decided then and there to switch course and put my lentils to use as a pattie, a lentil burger, if you will. I’m not saying these really very delicious, crispy flavorful lentil patties have completely cleared my mind of macarons—my daydreams consist of a honeymoon in Paris just so I can visit Laduree—but they are more than worthy of the plate during a meatless, sweetless commitment and, I suspect, long after. This recipe is adapted from Martha Stewart Living. Makes 8 small, delicious patties. In a small saucepan, cover the lentils with water by a few inches and bring them to a boil over high heat. Add a teaspoon of salt and reduce the heat to simmer, cooking until the lentils are tender, about 20 minutes. Drain and cool the lentils for about 10 minutes, stirring occasionally to release the heat. Puree half of the lentils, the onion, eggs, and bread crumbs in the food processor, blender or with a potato masher. In a medium bowl, combine this mixture with the remaining lentils and season with 1/2 teaspoon of salt, pepper, and 2 tablespoons of chopped parsley. The lentils can be chilled at this point for up to one day; bring to room temperature before proceeding. Form patties with about 1/4 cup of the lentil mixture for each. In a large skillet, heat 2 tablespoons of the olive oil over medium heat. Cook the patties, in batches if needed, until they are golden brown and crisp on each side, flipping them once. In a small bowl, stir the yogurt with a pinch of salt until it is smooth and creamy. Arrange the lettuce leaves on a platter or individual plates and lay the lentil patties over them. Serve them with the yogurt, drizzling the lentils and yogurt with olive oil and sprinkling all with chopped parsley and a pinch of cayenne pepper. The Silver Lining May I ask for your vote for Lebanese cuisine?! 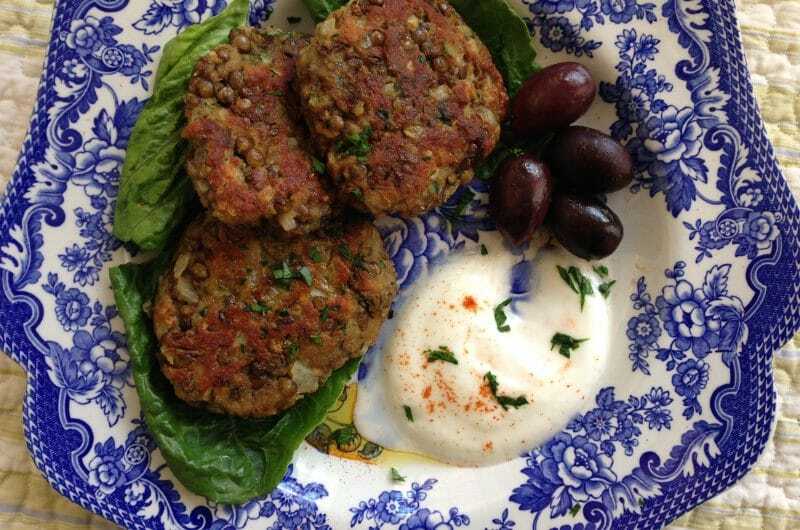 25 Responses to "Crisp Lentil Patties Recipe"
Great Diane–let me know how you like them! It is interesting that Martha Stewart is leaning towards Eastern Med cuisine these days too! These lentils sound delicious, I have never made them with French green lentils before. Yum. Very interesting Joumana, to see our ingredients and flavors all over the place now. Wonderful! You are so cute! I too have forsaken candy (but not dessert) for Lent – and Facebook. Those are my public ones. It is painful, but those macarons don’t qualify as candy so… I also observe the many meatless and fasting days. I was wondering as I read this story (it is about Lentils, right? 🙂 if you have ever featured Mujaddara. But. alas, as I was checking the spelling of it, your blog was listed (it’s how I found you! 🙂 and therefore…done! Jim!! We stand strong together!! Thanks so much and glad you found the mujaddara (the spelling is so curious for all of the transliteration, isn’t it?). Spellings, and how I have pronounced them all my life, continue to baffle me. Thankfully, Google understands and helps me. But, I don’t speak Arabic (only Spanish, a little French), I just know foods, some phrases, and the things yelled at me when I was apparently mischievous or bratty in some way. Jim, you make Maureenie laugh!! Thank heavens for Google. Like you, we learned all bad words in Arabic, and we love to use them liberally…. Maureen I just love mujaddara anytime but especially during Lent, but will have to try the patties. Thanks. Can one also use brown lentils for this? Brown lentils should work, Jonathan–just be sure not to overcook them because they turn to mush easily. Try a shorter cooking time, more like 15 minutes. Oh Maureen, I’m going for it! Then I want to try this Coconut Tea with Honey & Lime my friend talks about. Thanks as always for the inspiration! You go girl!! That tea sounds amazing….miss you…thanks Bridget and let me know how you like it ALL! Oh – I can’t wait to give this a try Maureen — the lentil paties that is … not those WOW macaroons you have pictured (as a Type 1 diabetic – I do have the will power to resist taking a peak at the recipe – yes I can do it – yes I can LOL).! Tonight’s meal (I didn’t know it was Meatless March) – is a vegetarian dish – a casserole or as we like to call it here in Quebec – cassoulet – made with white beans/winter veggies/tofu – all simmered in a lovely veggie broth with herbs de Provence (tho’ I added abit of exra lavender to the mix). Your cassoulet sounds just delicious! We WILL resist macarons, we WILL resist…. Let me know how you like the lentils too, Anna, and thank you! I made these last night (as a side dish for chicken) and they were a huge hit. Huge! I sprinkled some Maldon sea salt on them before serving. Thanks a million for posting such a great lentil recipe, Maureen – I’m trying to work more legumes and beans into our meals and this will definitely be a regular thing. This post made me so hungry!!! Such beautiful food and photos! My fingers and toes are crossed for this win!!!!! Made these this weekend and they were so good could have eaten them all at once! Delicious! That’s great, thank you! We’re about to eat them but I snitched a taste and I LOVE them! So good for my lo-carb diet too! Another item for Helen’s graduation party–the vegetarians will love it! I’m so glad you love them as much as I do, Vicky! A real go-to, sure-fire-delicious and super-healthy meal. Great idea for the party. I’m now thinking these would be great made tiny as appetizers for a cocktail party, too…. Hello Maureen: One of my customer told me to check your blog and I am glad she did. I love it and and I love the way your write. My sito used to take couple days old mojadara to make similar patties. I am going to try this recipe because I love lentils and both my Lebanese husband and daughter are vegetarian and I always on the look for new recipe. Sanaa, I am delighted you are here, thank you! What a great idea your Sitto had to make the patties out of mujadara. And I see you have a restaurant and books, all wonderfully interesting. I hope your family enjoys this recipe, and I hope you will visit here often and keep in touch! 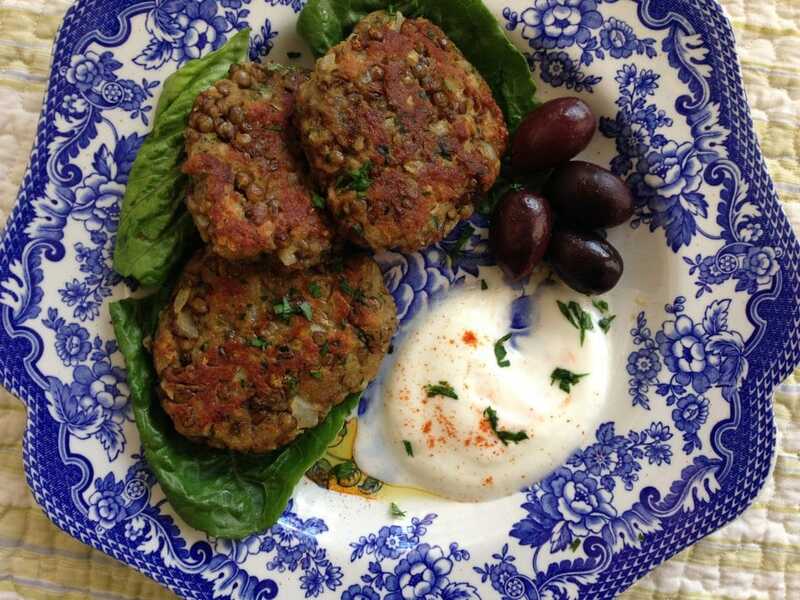 Your lentil patties look delicious! I love any kind of patty/burger like this, especially with plain yogurt, which I prefer with a savory meal as opposed to eating it sweet. Happily, I just found your blog & subscribed!